Just 11 days away from Christmas Day and lots of Christmas shopping left to do! If our cyclamen isn't on your list yet, it should be. This gorgeous plant starts blooming in the fall and grows all winter. Your holiday cheer will last long past winter vacation. By the time it fades, the spring will have reared it's head to get your spirits right back up where they should be. 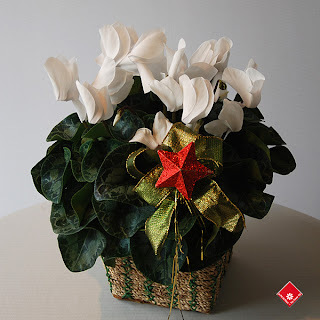 For a limited time, the cyclamen is on sale, which is just as well because "sale" is The Flower Pot's middle name. Type CYC303 to get 20% off your Christmas gift. Looking for something lower on the price scale? Try one of our Rockin' Christmas Trees! They are so adorable, festive, and perfect for students with tiny apartments. If evergreen isn't colourful enough for you, have yourself a Candlelit Christmas with 18 red roses and red candles as a centerpiece. If these still don't tickle your fancy, why not call us for advice at 514-938-1234 or drop by to visit our poinsettia-filled Griffintown shop?